Create each familiar "character" by choosing their hobby, skin tone, hair color, clothing, and name. 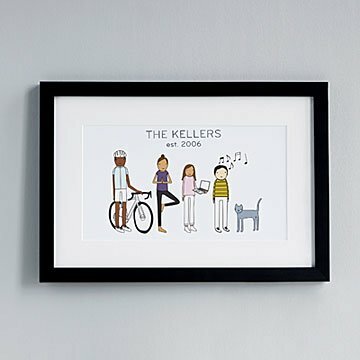 Every member of your family is unique, and this charming personalized art celebrates the passions and pastimes that make them, well, them. Create each familiar "character" by choosing their hobby, skin tone, hair color, and clothing, then add your family name and year established (optional). Give the playfully creative piece to the person in your life who can't get enough of their special bunch. Printed on 100% archival-enhanced matte paper. Hanging hardware included. Illustrated by Shelly Klein in Michigan. Made in Portland, Oregon. Check out our Personalized Family Print. Check out the Personalized Hobby Blanket here. Check out the Personalized Couple Hobby Blanket here. Unframed prints are 8" x 11.25", 8" x 19.25" and 8" x 32.25"
Copyright (c) 2018 - Personalized Family Hobby Art owned by K Studio and licensed to Uncommon Goods LLC. All rights reserved. I ordered several individual family prints with frame. Everyone whom received the pictures were blown away with the product. I liked how there are so many character options when putting a family together. The framing, packaging and prints are all of outstanding quality. They let me tailor it after I submitted for the perfect final piece! It was fun designing the gift with the grandchildren. This picture was great for the grandmother who has everything. It was fun designing the picture with the grandchildren. They picked out which "character" they wanted to be and their own hobby. The only reason I didn't rate it a five was because you cannot see the black daschund's face. I absolutely love it. It is impossible to get my 6 dogs and 2 cats together for a single family photo. I was able to customize this to include all 10 of us. It hangs over the head of the bed in the guest room. It makes me smile every time I look at it. The proof arrived in 24 hours and the final product was beautifully executed and packaged very well. The one reason I gave it 4 stars was because of the black dog. It is very difficult to see any of his facial features, it's fine, but wish there was a way to improve that.